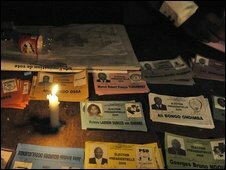 Counting has begun in Gabon, following an election to choose a successor to President Omar Bongo, who died after 41 years in power. Scheduled polling closed at 1700GMT but some stations continued to accept votes after that as they had opened late. Turnout was said to be be high with long queues at some polling stations. President Bongo's son, Ali Ben Bongo, is favourite to succeed but the poll has been marred by the pullout of a number of candidates. Five of the 23 withdrew on Friday and another, Cassimir Oye Mba, pulled out on polling day. He said he did not want to vindicate a "calamitous electoral process which doesn't look like being clean and credible". He was one of the major rivals, along with Andre Mba Obame. In the capital, Libreville, the atmosphere was described as tense throughout the day. One voter in the Louis district, Tony Rapariga, told AFP: "If Ali wins, we will burn everything. You will not find even 10 of his supporters here. It's impossible for him to win." The results of early counting are expected within hours but the full tally is not due for a few days. There have been more than 300 observers overseeing the vote. 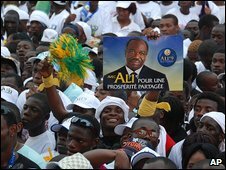 Ali Ben Bongo has promised to boost what he says is the prosperity that Gabon enjoyed during his father's years in power. But his rivals say there has been endemic corruption and favouritism in Gabon. Omar Bongo was one of the world's richest men, with a string of properties in France. He was an unflinching ally of France and a key element in French influence in Central Africa. BBC Africa analyst Martin Plaut says that Ali Ben Bongo is seen as less closely linked to the French elite than his father, despite being educated at the Sorbonne. He is also somewhat detached from ordinary Gabonese, struggling to speak local languages with real fluency, our correspondent says. Gabon is sub-Saharan Africa's fourth biggest oil producer and Africa's second biggest wood exporter, although most of its 1.4 million people live in poverty. African view: Will the Bongo dynasty continue?